Hyundai launched into the electrified car market in a big way in 2016, with its Ioniq fastback. Based on a bespoke platform made for electrification, the Korean carmaker decided to cover all bases by launching the Ioniq in a three-pronged attack: it comes as a Hybrid, a Plug-in Hybrid and a full Electric model. That gave buyers all the electric car choice they could want and, as a result, it ensures the Ioniq is a rival for a wide variety of HEVs, PHEVs and BEVs of similar size. With no trim grades to speak of (each of the three types of Ioniq came with a comprehensive specification from new), the only differences to discuss are the three drivetrains. The Hybrid and the Electric came first, in 2016, with the former using a 1.6-litre, four-cylinder, direct-injection petrol engine (105hp/147Nm) along with a 1.56kWh lithium-ion battery that powers a 43.5hp/170Nm electric motor, for total outputs of 141hp and 265Nm. The front wheels are driven through a six-speed dual-clutch gearbox (DCT), with best consumption of 3.4 litres/100km (83.1mpg) and 79g/km of CO2 – these figures are achieved on 15-inch wheels, however, with optional 17s these numbers adjust to 3.9 litres/100km (72.4mpg) and 92g/km, which does affect road tax by adding an extra €10 per year. The Electric junks the petrol engine and the DCT for a pure electric drivetrain with an 88kW (120hp) motor and a 28kWh battery – it can run for up to 280 zero-emissions kilometres on a single charge. The Plug-in Hybrid arrived a year later and uses pretty much the same running gear as the Hybrid, only it has a bigger 8.9kWh battery and a 61hp electric motor, meaning it can go 50km on electric power alone while returning up to a phenomenal 1.1 litres/100km (257mpg) with CO2 as low as 26g/km. All models have five seats, but the boot is smaller on the Plug-in Hybrid and Electric variants, at 350 litres, as a result of their bigger battery packs; the Hybrid wins this department as it has a 443-litre boot. It really does depend upon what you need the car for, as the two part-petrol models will be the better choice if you need to go long distances on regular occasions; but it’s hard to ignore the allure of the pure Electric Ioniq. It has slightly different front-end styling, because it needs no cooling for a combustion engine and so has a smoothed-off radiator grille that looks suitably futuristic, while it has a usable range on a full charge plus the lowest running costs of the three Ioniqs. The Hyundai Ioniq makes an excellent used buy, as its choice of three drivetrains means there should be a model to suit everyone – the Hybrid is the most conventional-to-drive, the Electric the most environmentally friendly and the Plug-in Hybrid provides a great middle ground between the two. 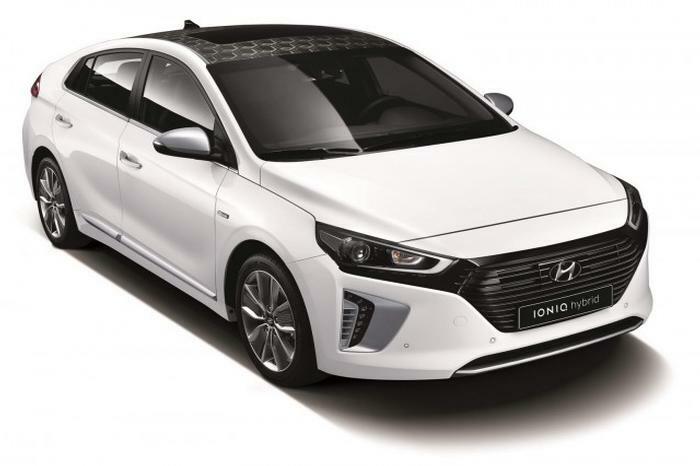 The only problem with the Ioniq is sourcing one; as there are far fewer examples of the Hyundai on the used market when compared to the Toyota Prius, which has been around for much longer.